Normal mission: Find the entrance to Eggman's base! Hero mission: Shoot down Eggman's airship! 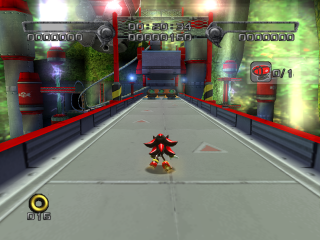 Iron Jungle is one of five possible fifth levels of Shadow the Hedgehog; in the game's branching path structure, it follows from taking a more neutral, non-aligned path through the previous levels. Set on the approach to Eggman's Lava Shelter, this stage involves more than its fair share of set-piece fighting, with Egg Pawns and Shadow Androids guarding doors and elevators; Shadow is required to take them out before proceeding on. Chaos Controlling into the level either Prison Island or The Doom, Shadow drops onto the steel-plate floors to find himself faced with... himself. The Ultimate Lifeform has popped up right in the middle of a squadron of Shadow Androids. While existentially hazardous, this at least means Eggman doesn't spot him while lecturing the troops on his Egg-O-Matic. After the Eggman Fleet has been dealt heavy damage by the Black Arms in Sky Troops, Eggman is falling back to his base to formulate a new strategy. However, the Doctor finds himself pursued by G.U.N. forces, not wasting an opportunity to attack the Eggman Empire while Robotnik is on the back foot. The vanguard of the GUN forces is accompanied by E-123 Omega, likewise determined to kick the Eggman while he's down. Omega wants Shadow's help in shooting down Robotnik's personal transport, the Egg Balloon. Shadow can help Omega, or abet the fat man's retreat by knocking out the GUN forces. The neutral option is to ignore them both and just hasten inside Eggman's base. Whatever route Shadow takes, they face the Egg Breaker as the boss. Before the fight, Shadow asks Eggman if he is an android just like those from the start of the level, to which the Doctor has no compunctions in lying "Yes". If Shadow is being accompanied by Eggman's Drone during the level when fighting some of the heavy GUN mechas, the Doctor will remark "That's just like the Big Foot from Prison Island!. Robotnik is apparently getting confused with the B-3x HOT SHOT, a similar mech which actually was faced by him and Shadow on the island. Right after the second checkpoint when you go through the door and drop into the room with some Eggman robots. Drop into this room and look behind you. Behind the door are three tank turrets. These things can be a significant help in shooting down the Egg Balloon. This page was last edited on 31 October 2017, at 18:19.